In Korean, Ddangkkeut means ``the edge of the land.'' Usually terrifying stories are associated with such an expression. But this is not the case in Korea, which has its own edge of the land. On the contrary, Ddangkkeut is a quite nice and beautiful place, a tourist zone situated on the seashore of Haenam County of the South Jeolla Province. There are buses and boats that can take you to the ``edge of the land.'' Also if you ask a taxi driver to take you to the edge of the land, you will not hear advice to visit a doctor. For the people there, Ddangkkeut is one of the usual villages. Actually Ddangkkeut has very solid grounds to receive such a special name. Geographically it is the most southern point of the Korean Peninsula, further there is only water of the Korea Straits. If you look at the map of Korea, you get the impression that there are some places that are situated more south than Ddangkkeut. But this is the result of the distortion that appears on every map. 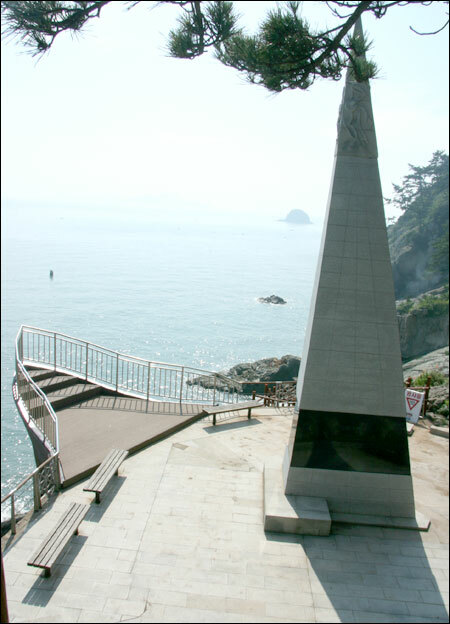 Ddangkkeut is the most southern point of the mainland of the Korean Peninsula. Only islands are south of Ddangkkeut. Ddangkkeut received its name long ago. Centuries-old Korean books has information that ``on the very south of Korea in the Haenam County, there is the edge of the land (Ddangkkeut) which is 1,000 ris (an old unit of distance) far from Seoul, and the most northern point of Korea is in Onseong, North Hamgyeong Province currently in North Korea, 2,000 ris away from Seoul.'' Probably that is why Korea is sometimes called as a 3,000-ri-long country. The Ddangkkeut tourist zone is quite popular and famous among Koreans. This place was a favorite place for Korean poets who loved to come here to get inspiration for their verses. There are two main interesting points in the tourist zone: a 10-meter-high stone stele marking the most southern point of the mainland and a quite original and interesting Ddangkkeut observatory situated on a hill nearby. Well, actually everything there was made to satisfy tourists ― comfortable benches around, impressing stele and a special spot for taking pictures with the best view. You may want to go a few meters down to touch ocean waves as the whole view with the sea, rocks, and pine trees is very nice. If you decide to do so, be a bit careful, as sometimes you may encounter ``the echo of inter-Korean confrontation'' ― pieces of sharp glass fixed with cement on the rocks. Originally the pieces of glass were put there to prevent North Korean commandos from infiltrating South Korea. Nowadays when two Koreas held friendly summits and talk about cooperation and peaceful unification, the danger of enemy commandos appearing there has gone, but such pieces of sharp glass, although mostly destroyed, still can be seen from time to time on the seashore. After you finish taking all pictures around the stele, it is recommended to see the Ddangkkeut Observatory. To get there you can walk up some steps. As the height of the hill where the observatory stays is 156 meters above the sea level, some may consider as challenging. But it is worth the effort. There are some places to have a rest while enjoying the view of the sea and numerous islands. Also there is a monorail between the parking lot of Ddangkkeut village and the observatory. You may make your trip in the opposite way ― first go to the observatory on the monorail and then walk down to the stele and after that return back to the parking lot by a path going along the seashore. The Ddangkkeut Observatory has very interesting form. It is a ten-story building, 39.5 meters high. From the front, it looks like a column with a circle of an observation site in the upper part. But if you look at the building from behind, it appears like a funny human-like creature with cute ears. You have to pay some money (1,000 won) for the observation, but it is worth to pay for the visit. You will enjoy a bird-eye view of the surrounding sea, dozens of islands, the Ddangkkeut village and adjacent mountains. If you manage to come to Ddangkkeut, there are at least two more interesting places, which should be visited. One of them is a surprisingly big museum of dinosaurs. As it is situated near the Uhangni village, its official name is Uhangni Dinosaur Museum. In this area, footprints of dinosaurs from the latter Cretaceous period of the Mesozoic era, about 80 to 90 million years age, were found. The museum has a big main building where you can get a very detailed understanding about the life of those giants. Outside there are several pavilions built above the footprints. Actually I was amazed that such a big museum (the biggest museum in Korea devoted to dinosaurs) was built in such remote region of the country. Around the museum there is quite a big park with natural-size sculptures of dinosaurs. The museum is a very nice place to get a lot of interesting information without being bored about the former lords of the planet and to have a good walk while enjoying beautiful scenery. The other place worth visiting is Mihwang Temple at the foot of the beautiful Dalma Mountain. The temple is interesting historically and geographically. They say that Buddhism was brought here by the sea directly from India by people who founded Mihwang Temple. Also the temple itself is the most southern Buddhist temple of the Korean mainland. If you stand in the yard of the temple, you can enjoy the view of the sea and surrounding mountains, which are especially impressive at sunset.